William “Bill” McCoy was born in Syracuse, New York in 1877. As a young boy, his father often entranced him with tales of naval war stores from his Civil War service. Upon moving to Philadelphia, McCoy recalled: “I started nosing about the wharves on the Delaware [River] as instinctively as a bird dog ranges a stubble field.” After an initial two years of training aboard the Saratoga, a school ship used to train sailors, he spent several years on steamships as part of the merchant marine. McCoy was a tall man, almost 6 feet 2 inches, with broad shoulders and a tapered waist. He had steady eyes and was described as having a voice like a “fog horn.” In 1900, he moved to Florida where he and his brother Ben built boats on the banks of the Halifax River in Holly Hill, just a few short miles north of Daytona Beach. The Uncle Sam built in 1903,was used as an excursion boat on the Tomoka River. While the brothers continued to build boats, they also operated freight and passenger service between Daytona and St. Augustine and went as far south as Palm Beach. But boat passenger service slowed as motorized buses replaced water travel, and by 1920, their boat building business slowed to a trickle. Approached by a rumrunner with an offer of $100 a day to sail a boatload of illegal liquor from the Bahamas to the United States, the McCoys turned down the offer. 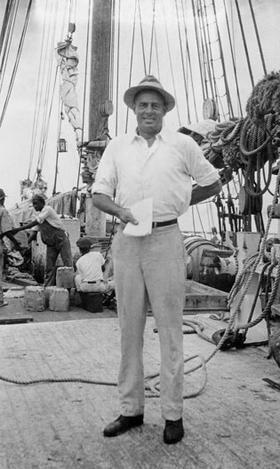 But eyeing the potentially lucrative opportunity for themselves, the brothers sold all their small boats and bought the Henry L. Marshall, which they sailed to the Bahamas. Built of white oak, when loaded the 90-foot fishing schooner could carry 1,500 cases of crated liquor, or 3,000 cases in burlap bags. So began Bill McCoy’s smuggling career. This entry was posted in Prohibition. Bookmark the permalink.